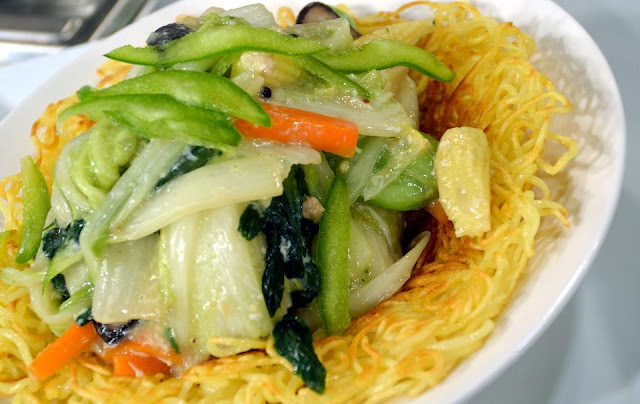 Delightful stir fried vegetables rested on a crispy noodle nest. You will hear the crunch of the noodles as you are eating it at the beginning, and as you eat, the noodles will soften gradually. If you like your noodles softer, just mix it in more with the sauce. I personally prefer my noodles crisp! 1. Stir-fry the ginger puree and garlic puree. Flambé with Chinese wine. Add all vegetables. Add chicken stock. 2. Bring to a boil and thicken with cornstarch and, lastly, white egg. Season to taste and set aside. 3. Have ready heated oil in a wok, then place noodles and stir from time to avoid burning noodles. Then turn once, continuously stirring until noodles turn brown. 4. Place on round platter and pour over the top with vegetables. What a delicious combo! I mean, not only delicious, more important it is healthy! Good work.